The TWM-354 Tactical Weapon-Mounted Long Gun Light with Remote Pressure Switch uses a CREE® LED rated 350 lumens. Working in conjunction with a high-efficiency deep parabolic reflector it creates a usable beam of light rated at 215 meters. 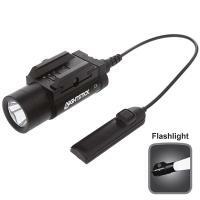 This weapon light attaches to a Picatinny Rail of a long gun to operate the momentary-on or constant-on lighting modes. The housing is constructed from aircraft-grade 6061-T6 aluminum. Package includes light with remote pressure switch installed with pressure pad (8" cable), rail connector, alcohol pad, 2 adhesive-backed hook and loop mounting strips, 1 set of spare cross rail inserts and cross-rail mounting screws, Allen Wrench and 2 CR123 batteries.